Fou Gallery is delighted to invite you to our current exhibition Chen Dongfan: Nevermore and join two concerts with The Lumisade Quintet. To present the intrinsic connection between Chen Dongfan’s Space Painting Project (Studio 2018) and the present exhibition at Fou Gallery, the first concert will be held at Chen Dongfan studio on Saturday, May 19, and the second at Fou Gallery May 26. In this series of events, you will walk through Chen Dongfan’s artworks in both his studio space and Fou Gallery and enjoy two unique music concerts presented by The Lumisade Quinte. 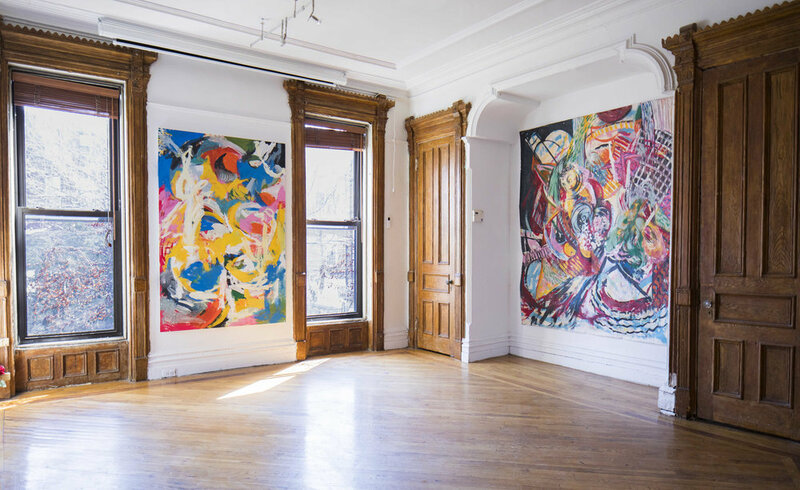 In Chen Dongfan studio, Chen’s space paintings extend from the ceilings to the floor and four walls, presenting a wild and dynamic space filled with bizarre moments. Even though a concrete imagery is absent, the vitality of life is present through the explosion and fluctuation of lines and colors. In the exhibition Nevermore at Fou Gallery, Chen Dongfan presents a collection of his recent abstract works that show an increasing tendency of improvisation. The works were mostly created in the new studio, conveying the artist's pursuit of spiritual significance through pictorial forms. The lumisade Quintet will present a wind quintet. It is made up of five unique instruments - flute, oboe, clarinet, horn, bassoon - and in this way the range of sounds accessible to composers is limitless. Each piece in this program is like a large canvas for the composer to paint upon, each phrase an abstract form made of a range of textures and colors, each instrument’s unique voice combining like brushstrokes to form a vibrant, living work of art, constantly shifting and changing through time. In this way, each piece in this program captures the wild and untamed, the grotesque, and the sublime. The Lumisade Quintet formed in early 2018 with a commitment to exploring the wide range of repertoire written for wind instruments. Chen Dongfan with Space Painting Project (Studio 2018). Photograph by Inna Xu ©Chen Dongfan, courtesy Fou Gallery and Chen Dongfan Studio. Nevermore - Music Concert with The Lumisade Quintet at Chen Dongfan Studio. Photograph by Inna Xu. Nevermore - Music Concert with The Lumisade Quintet at Fou Gallery. Photograph by Nadia Peichao Lin. The concert video is for Chen Dongfan: Nevermore - Music Concert with The Lumisade Quintet.Videographer: Jing Lin, Echo He, courtesy Fou Gallery and Chen Dongfan Studio.